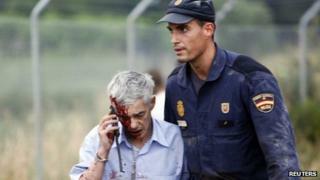 A recording has emerged in Spanish media of a phone call made by a train driver moments after his train derailed in northern Spain, killing 79 people. Francisco Jose Garzon is heard telling a colleague he was travelling at 190km/h (118 mph) instead of 80km/h and became distracted. He also said he had previously complained that the bend, where the accident happened, was "inhuman". The driver and the state-owned railway firm Renfe are on trial over the crash. Magistrate Luis Alaez has charged Mr Garzon with "79 counts of homicide and numerous offences of bodily harm committed through professional recklessness". The driver is not in jail but remains under court supervision. The accident, which happened during the evening on 24 July near the Galician city of Santiago de Compostela, is one of the worst rail disasters in Spanish history. Some 170 people were wounded in the crash. El Pais newspaper obtained a recording of the phone call Mr Garzon made to activate the emergency protocol after the Alvia train smashed into the wall, caught fire, and derailed on 24 July. "There must be many injured, [the train] has turned over, I can't get out of the cabin," he is heard telling a colleague at Madrid's central station. During the conversation, Mr Garzon repeatedly says "poor passengers", adding: "I hope no-one has died." He also admitted going too fast at the time of the crash. "I got distracted and I [was meant] to be going at 80, but I was going at 190," Mr Garzon said. "I had already mentioned to the safety people that this [curve] was dangerous, that one day something like this could happen." Judicial authorities earlier said the train was travelling at 192km/h (119mph) on the bend where it derailed. Crash investigators opened the train's "black-box" data recorder to find the cause of the crash. Meanwhile, another recording has emerged of the driver's pre-trial questioning, the BBC's Tom Burridge, in Madrid, reports. In the recording, Mr Garzon is heard giving evidence about a phone-call he received from a train conductor moments before the crash, in which they discussed which platform they would pull into. The driver told the court he lost a sense of where the train was during the call. By the time he had engaged the train's electric and pneumatic brakes, it was too late, Mr Garzon said. The investigation into the crash will also consider why there was no automatic braking system on the curve in question, our correspondent reports. The safety mechanism has since been installed at the scene of the accident.